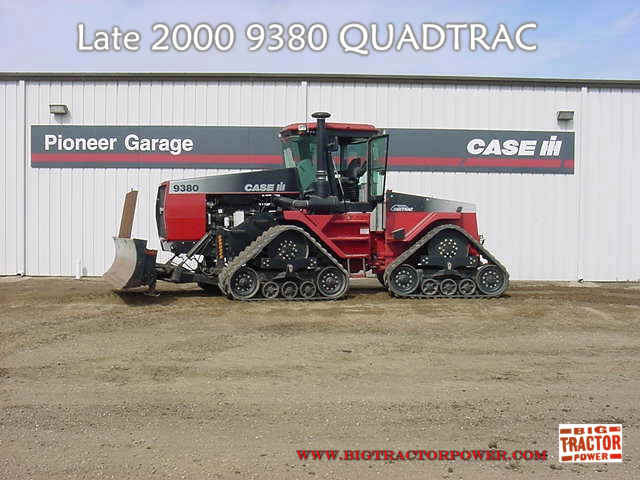 The QUADTRAC � is four-track powerhouse built from the ground up by CaseIH engineering. It has the advantage of tracks and the maneuverability of a 4WD wheel-type tractor. Best of all, it possesses all the advantages of the legendary STEIGER � tractor: a rugged chassis, powerful engine, responsive transmission, comfortable cab and more. Much more. Each 30" rubber track provides 68.5 inches of contact with the ground surface. Each track can pivot up and down 10 degrees, allowing the track assembly to follow the ground contour. Because each track assembly works independently, the track remains on the ground. And with the 26 degrees of oscillation between the front and rear of the tractor, operators enjoy a superior ride, while the tractor provides superior flotation and traction. Depending on the tractor�s configuration, soil compaction will be as little as 4.9 to 5.3 pounds per inch! Even though the QUADTRAC tractor looks very different, it steers like a conventional 4WD tractor. The unit provides a 19.5 ft. turning radius with two distinct advantages over a two track unit. QUADTRAC tractors give you the ability to turn under load�as you turn, the tractor pivots in the middle allowing it to maneuver like a conventional 4WD tractor. Because the unit pivots like a conventional 4WD tractor, you do not need to skid a track to turn, so soil ridging and soil disturbance is minimal. 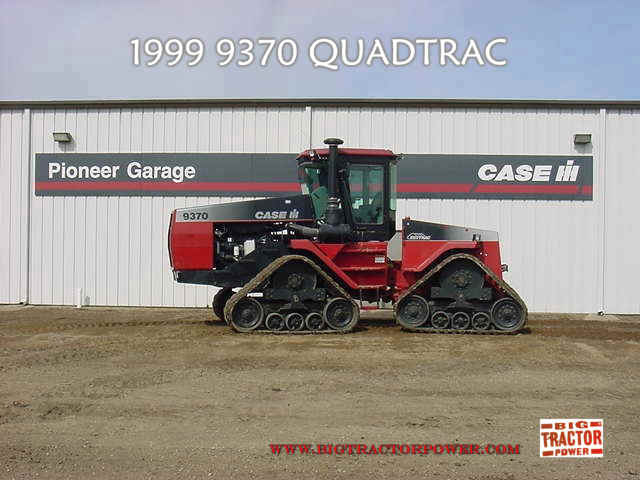 Maintenance on QUADTRAC tractors is minimized because the track assembly requires no daily maintenance. All pivots operate in lube-for-life bushings; the idlers and rollers operate in sealed tapered bearings, and the track tension is maintained as the operator operates the tractor hydraulic system. As far as telling a 9370 & 9380 "non-decaled" version from each other, it can be difficult if you do not know what to look for. First way to tell is to look at the serial# tag. 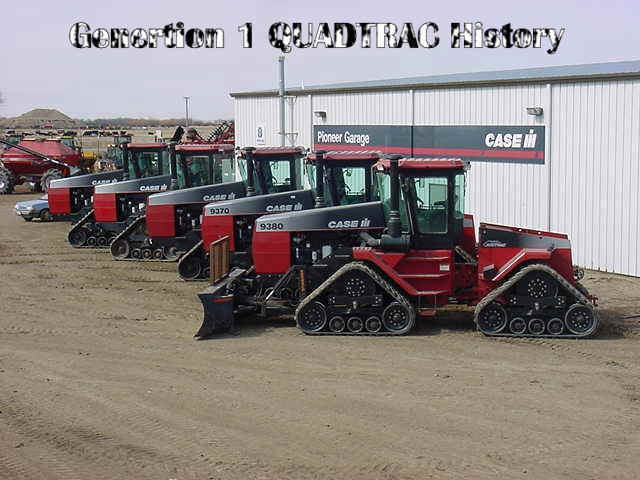 Case never referred to these tractors as "Quadtracs" in their computer system, they were referred to as "9370Q" or "9380Q", which is how they are marked on the serial# plate. 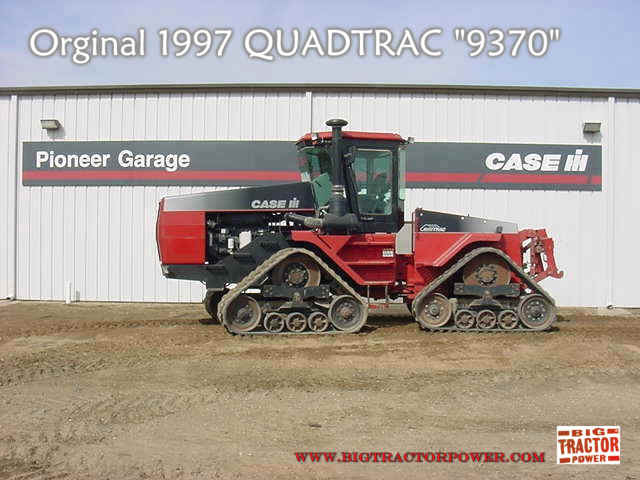 When 9380 Quads first came out, the 9370 had a smaller 4" axle while the 9380 Quads had a 4.5" axle. 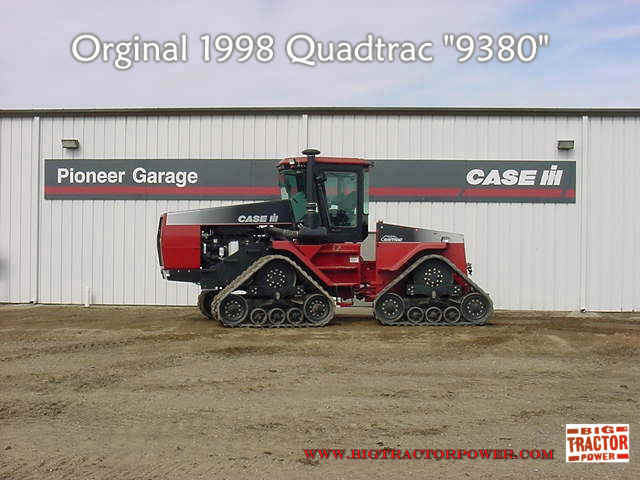 9380 Quads also had a beefier transmission(same as a 9390 powershift), while the 9370 Quad had the same trans. as a 9380 wheeled tractor.